The advancement of 4K technology has truly enhanced the video viewing concept especially for a film like this one. 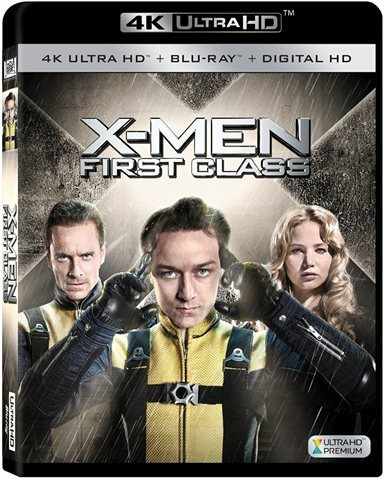 With one of the most favorite and beloved superhero Marvel franchises, comes the 4K release of X-Men: First Class. X-Men: First Class was a long awaited prequel in this franchise bringing us back to the origins of the epic beginning of Professor Charles Xavier and Erik Lensherr. Providing us not only the history of these two young men destined to become arch enemies, X-Men: First Class takes us into the world of the Holocaust and the influence that horrific history has upon Erik Lensherr (Magneto) and contrasts it with the world of the super rich of Charles Xavier. For the first time, and what could possibly be the only time, Magneto and Professor X work together as close as two people can, to stop the greatest threat ever known – a nuclear Armageddon. Not only does X-Men: First Class provide the history of how these two men developed their powers, it also provides the history of the rift between these two powerful mutants and their factions. X-Men: First Class is a beautifully written story about the coming-of-age of young mutants, ready to save the world at any cost. What is lost, though, is a true friendship - one that carves a dividing line into stone from which they can never recover. Usually, one comments on the chemistry between the love interest of the male and female stars in a movie, but Director Matthew Vaughn creates such chemistry between James McAvoy (CharlesXavier / Professor X) and Michael Fassbender (Erik Lensherr / Magneto). McAvoy and Fassbender are polar opposites in the reasons theywork together and use their powers to save the world- reasons that will ultimately break up the duo as heartbreaking as any epic romance we've seen. Very rarely do we see this chemistry between two make characters, and Matthew Vaughn has such perception in his direction of these characters, that without his expertise and the experience of these actors, X-Men First Class would otherwise fail in establishing the friendship that ultimately results in the animosity that carries this franchise forward. Not to be ignored, Jennifer Lawrence's character, Raven / Mystique, is timeless. She never seems to age substantially in any of the films. Her dedication to Xavier is well developed in the movie and her origins and touched upon to the degree that the audience is shown how she ends up with Xavier. Where she really comes from is still a mystery. Oliver Platt is remarkable as an FBI agent who believes in mutants and shows us the origins of Cerebro. The advancement of 4K technology has truly enhanced the video viewing concept especially for a film like this one. The 2160p resolution and 2.35:1 aspect ratio is brilliant and the clarity is amazing. Each effect is sharp and clean and the color spectrum is crisp. Couple that with the DTS-HD Master Audio 5.1 and you have a home theater experience unto itself. The audio mix is good for the most part and the explosions can be felt throughout every bone in your body. If you haven't yet invested in a 4K Blu-ray player and TV, you may want to add them both to your holiday wish list. This 4K Blu-ray release is chock full of special features that simply enhance the value of this purchase that can't be found in other places. Specifically, there are four featurettes on this Blu-ray that provides some insight to the new characters and the ultimate movie experience. - Extended/Deleted Scenes: Over six minutes of never before viewed scenes. One of my favorites is Charles opening the doors to find that Alex has "decorated" the training room in fire. My favorite cut is from another - "But for now I get to wear energy diapers." - Band of Brothers provides over 12 minutes of commentary for Producers Bryan Singer and Lauren Shuler Donner on creating the additional X-Men and casting for those parts. They also explain that while they don't fit within the continuity of the comics, they did fit the continuity of the movies, which was more important in their opinion to their viewers. Tarquin Pack, Executive Producer also provides insight into the casting and why the actors were cast in their respective roles, as well as cast interviews and even screen tests. This is a packed 12 plus minutes! - Second Genesis is over 10 minutes filled with more interviews and commentary of how the film of X-Men First Class was derived and why additional characters were added that were not featured in the comics. - Core Cadre of the X-Men is really a few minutes worth of an excerpt of how Bryan Singer, Producer, has brought so much to X-Men First Class and the family structure of all the actors. This is a beautifully written story that shows even sometimes saving the world comes with the greatest sacrifice two friends will ever have to make.